Carlos Ghosn at the 2016 Geneva Motor Show. Financial scandals at Nissan, Ford’s ideas on making profit from your personal data, cuts to oil output, fuel-economy numbers on four-cylinder pickups and fewer configuration options on the next-generation Ford Explorer. All of this and more in The Morning Shift for Monday, Nov. 19, 2018. Nissan chairperson Carlos Ghosn, arrested over alleged financial misconduct, under-reported nearly 10 billion yen, or $88.6 million, in compensation as around 5 billion yen, Reuters reported via Japan’s Jiji news agency on Monday. The alleged under-reporting of compensation took place over five years starting in 2011, according to Reuters. That detail comes after the reports of Ghosn’s arrest for his alleged financial misconduct, when Nissan said he used company money for personal expenses and “serious acts of misconduct.” Nissan started investigating Ghosn, the CEO of Renault and a Mitsubishi chairperson, after a whistleblower report, according to Reuters. The months-long investigation found “significant misconduct led by Mr. Ghosn himself,” Nissan CEO Hiroto Saikawa said in a press conference. 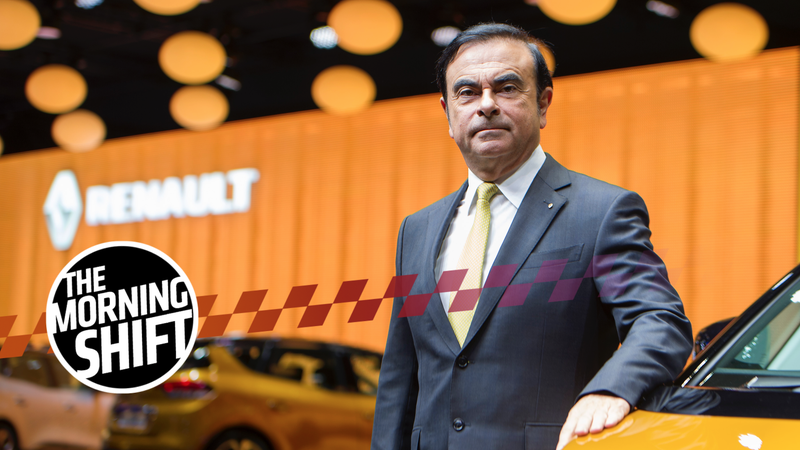 As the misconduct uncovered through our internal investigation constitutes clear violations of the duty of care as directors, Nissan’s Chief Executive Officer Hiroto Saikawa will propose to the Nissan Board of Directors to promptly remove Ghosn from his positions as Chairman and Representative Director. Saikawa will also propose the removal of Greg Kelly from his position as Representative Director. Nissan deeply apologizes for causing great concern to our shareholders and stakeholders. We will continue our work to identify our governance and compliance issues, and to take appropriate measures. We have more on this story here. Ford has had its share of problems lately. The company’s betting it all on cutting sedans and going to a lineup made almost entirely of crossovers and SUVs in North America, dropping it to near junk status this year. It’s also in this strange limbo between car company and tech company, teasing Mustang-“inspired” electric SUVs and buying things like scooter companies. But don’t you worry about Ford. Ford will be fine, perhaps thanks to the money it plans to make off of your personal data. You’re saving Ford! Wow. The Detroit Free Press reports that Ford’s global reorganization effort could lead to a new focus in terms of revenue: all of the data it gathers through its financing entity, Ford Credit. Selling buyers’ personal data that could determine their likes, dislikes, habits and otherwise for advertisers is a big source of cash these days, despite tracking people sounding like a totally gross, Big Brother-style of making money. But money is money, no less. More than $1 in $3 in profit is coming not from car or truck sales but the finance entity that makes loans to more than 5,000 car dealers and 4 million customers, mostly in the United States and Canada. That’s up from $1 in $4 in 2017, according to regulatory documents. Potential clues to the future path of Ford can be provided partly by Facebook, which has illustrated to shareholders the value of using customers’ personal information to earn billions. Advertisers buy not the customer information itself but access to the consumer based on data about their lifestyle. The scooter company Ford bought, Spin, has plenty of personal data—when people travel, major travel routes, popular destinations and more—and the Freep reports that Ford said it plans to share user data with partner cities. “We have 100 million people in vehicles today that are sitting in Ford blue-oval vehicles. That’s the case for monetizing opportunity versus an upstart who maybe has, I don’t know, what, they got 120, or 200,000 vehicles in place now. And so just compare the two stacks: Which one would you like to have the data from?” Hackett said, according to the podcast transcript. It’s always comforting to think about how the boxes you fill out on credit and loan applications will be used. President Donald Trump asked Saudi Arabia to raise oil production over the summer to compensate for lower Iranian exports, Reuters reports, which led to an oversupply of oil, price drops, continuing imports from Iran and some angry oil suppliers. Trump didn’t deliver on the Iran cuts he promised, and Reuters now reports that Saudi Arabia plans to retaliate with major supply cuts. CNBC reports that while Trump’s spent months threatening sanctions against Iran to plummet their oil exports, but that when the Nov. 4 deadline came for the sanctions, major customers got six-month exemptions. That made Saudi Arabian suppliers mad, considering Trump asked for more oil from the area to make up for the coming Iranian cuts. Angered by the U.S. move that has raised worries about over supply, Saudi Arabia is now considering cutting output with OPEC and its allies by about 1.4 million barrels per day (bpd) or 1.5 percent of global supply, sources told Reuters this week. Reuters reports that on Nov. 5, U.S. Secretary of State Mike Pompeo said cutting Iranian exports “to zero immediately” would’ve been a shock to the market that could’ve resulted in a raise in oil prices. With the planned Saudi cuts, prices may very well end up in that situation regardless. When it comes to trying to sell four-cylinder trucks to a crowd of people who probably aren’t interested in just four cylinders powering their pickups, you’d think automakers would be all over marketing their fuel-economy ratings to show how much cash buyers could save. But that’s not the case with General Motors, which, according to Automotive News, said not to look at the labels because the trucks perform better than their rated fuel economy. While the city rating is up 13 percent, the combined rating is just 1 mpg more than for the 4.3-liter V-6 that the four-cylinder replaces as the standard volume engine. The 4x4 models get 1 mpg less. That puts GM’s four-cylinder in line with comparable truck engines from Ford (3.3-liter V-6) and FCA (3.6-liter V-6 with a light hybrid system) that are rated at 22 mpg combined. Ford’s 2.7-liter V-6 is rated at 22 combined mpg. Those engines, however, offer up to 25 or 26 mpg on the highway. As with diesel engines, they say, fuel economy will be better in the real world than its predecessor and will at least match comparable V-6 models from competitors. EPA testing methods as well as a larger design footprint also may have played a role in the lower-than-expected ratings, which GM may look to address soon. Eh. This is all fine, but the better approach here is probably advertising how well the four-cylinder truck does things like keeping beer cold, improving tailgating experiences, helping on the day job—you know, truck things. Much like one of your moves to clean out all of the clothes in your closet from “that one phase” of your life when you really didn’t know what you were doing, Ford’s simplifying some of the options in its product lineup, like the kinds of side mirrors it offers on the Ford Explorer. There was a lot going on back when it decided to offer 139 configurations for mirrors on an SUV, alright? Things got carried away. Ford’s therefore realized the error of its ways and is cutting that number from 139 to 25 for the 2020 Explorer, according to Automotive News, by making blind-spot monitoring a standard deal and offering only gloss-black mirror caps instead of matching them with the car’s paint color. At the same time, such streamlining is by no means a new concept for Ford, which made similar cost-cutting pronouncements under Alan Mulally a decade ago. Mulally vowed to cut the number of ways vehicles could be configured by more than half on 2009 models to help turn inventory faster. The Lincoln LS sedan, available in 50,000 varieties, was replaced by the MKS, with just 300. But within a few years, Ford had reverted to old habits amid a product blitz and a desire to generate extra revenue from more optional equipment. If you’re a fan of designing your side mirrors to be one of a kind and unique to you, you better jump on that 2019 Explorer before Ford cuts your creativity and takes your data home as a prize. The flaw in all the research was that by 1957, when Edsel appeared, the bloom was gone from the medium-priced field, and a new boom was starting in the compact field, an area the Edsel research had overlooked completely. I was at my mother’s house when writing this. She saw the Edsel on my screen, asking to make sure it was the Edsel. “When I was a kid, everybody made fun of that car,” she said. Neutral: What Was the Car ‘Everybody Made Fun Of’ When You Were a Kid?